Priority Made, currently on view at the Dorchester Art Project in Fields Corner, is a multifaceted show showing an extensive look at the Priority Mail stickers that street artists have been using for years. The show illustrates the different ways the stickers can be used and features a variety of artists pushing the boundaries of the intrinsically democratic art form. At the same time, the curators provide insight on the history of these stickers and the culture surrounding them. 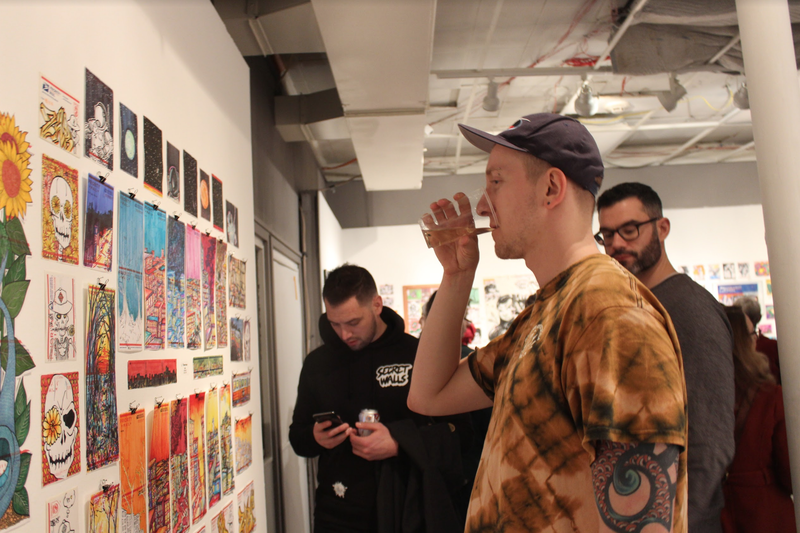 Ultimately, the most interesting aspect of Priority Made is how it connects with the community the gallery is a part of. Priority Made is so engaging because of the number of diverse contributors approaching the same material from varying perspectives. 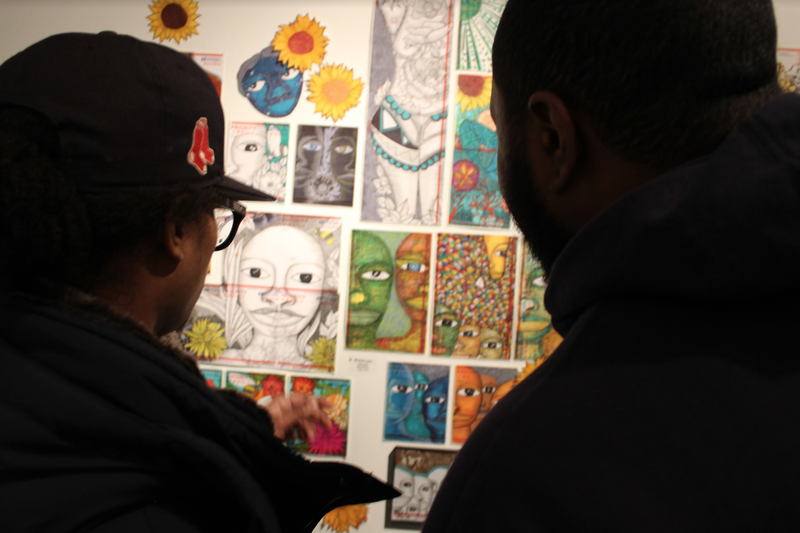 The show has over 100 participants, with big names from all over the US alongside local submissions—there are even stickers donated from kids at the Boston Public Library. These selections speak to the versatility of the medium. 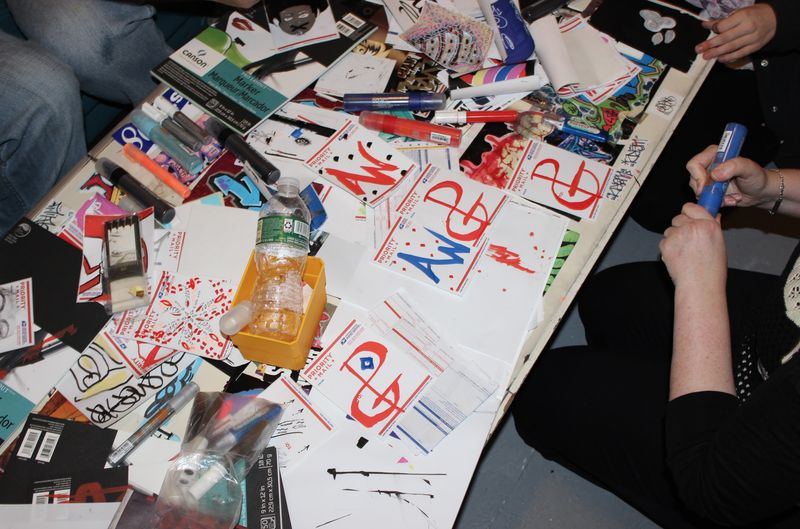 Artists covered their stickers with magic marker, paint, pen, spray paint, and collage. In addition to the wide range of mediums, the show includes many different styles of work. Stickers are displayed alongside artworks which utilize and incorporate stickers them. In the first room of the gallery was a large spray paint tag done by the artist Tense (@hiramtense). The works in Priority Made include a variety of themes, motifs, and topics: portraits, tags, and imaginative doodles fill every corner of the space. The sheer range of the show reflects the diversity of the community it represents. This speaks to why these stickers have endured for so long in street art: they are free, readily accessible, and ready for whatever approach you bring to them. The artworks are complimented by a section of the gallery which contains a retrospective look at the history of the Priority Mail sticker, tracking how the editions issued by the post office have changed over time. Priority Mail stickers from over the years are displayed next to a timeline with information about the benefits of each new edition, which points out which ones are more sought after than others. This interesting addition to the gallery impresses how long people have been using the Priority Made sticker. Through this exhibition, we can see how it began as a grassroots movement and transformed into a staple that still resonates today. To me, the most impressive part of the gallery is the interactive element—the back wall of the gallery is open for writers to tag as they please, and at the opening, there was a place for visitors to sit and design their own Priority Mail sticker. This creative aspect acts as a link between the members of the community and the gallery. Not only does this addition engage the viewer in the very art form they are viewing, but also encourages them to leave their mark on walls of the gallery, which are now more vibrant than ever. I found this thoroughly inspiring and would love to see more galleries provoke such powerful manifestations of creativity. I highly encourage you to visit Priority Made at DAP, and then head immediately to the post office to grab your own cache of Priority Mail stickers to decorate the city with. 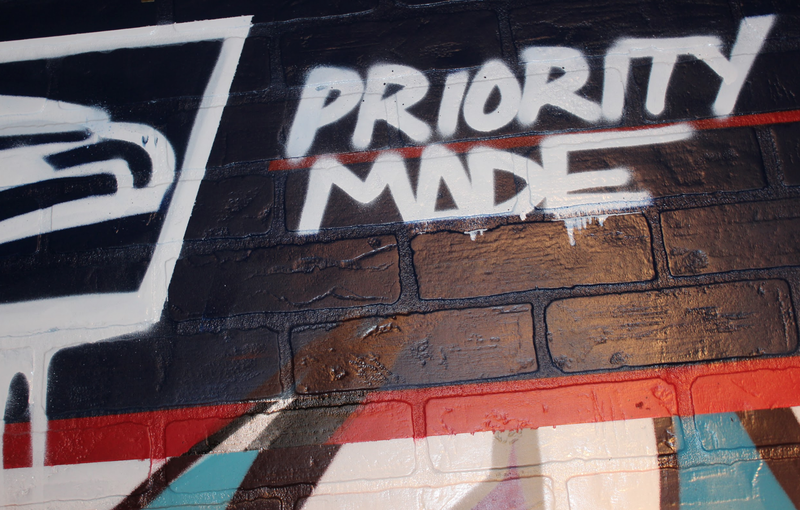 Priority Made will be on view at the Dorchester Art Project through February 9th, open Saturdays and Sundays between 12 and 6 pm. A closing reception will be held on the 9th from 6 to 10 pm. More information can be found here.